Christmas is already hyped in many websites and social networks like Facebook and Twitter with gift ideas, movies lists, best deals, etc. To save you time and energy, today, we’ve hand-picked the most incredible giveaway – $49.95 valued WinX HD Video Converter Deluxe giveaway that you should not miss. WinX HD Video Converter Deluxe, developed by Digiarty Software, Inc, is an all-in-one HD video converter/downloader/editor and slideshow maker that perfectly compatible with your Windows 10/8/7/Vista/XP. Luckily, for a limited time, you can download a free licensed copy for your PC at $0 and enjoy full features without limits (The same benefit is available for Mac users). But please note that only 500 free copies per day, so get yours now before they’re snapped up. 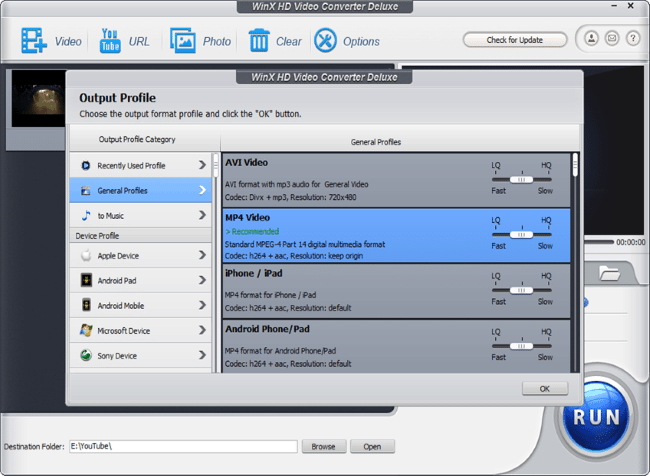 What Makes WinX HD Video Converter Deluxe Worth Trying? Controlled by a very simple and straight-forward software interface, WinX HD Video Converter Deluxe makes itself easy-to-use for all levels of users. Seeing is believing, let’s have a quick walkthrough of its features via a range of numbers. WinX HD Video Converter Deluxe gives us a flexible, fast and high-quality video conversion experience with built-in 320+ video codes and 50+ audio codecs, so does its Mac version. No matter you want to convert 4K UHD, 1080p HD video, MKV, AVCHD, MTS, AVI, MP4, MOV, H.264, etc, such as MKV to MP4, MTS to MOV, MP4 to AVI, you can always reply on this best video converter to get the job done. Plus, its converting speed beats other video converters thanks to the unique support of Intel QSV & Nvidia NVENC hardware acceleration tech and multiple CPU core use. Nowadays, most people (including me) like to watch movies, TV series via smartphones and tablets on the daily commute, in the journey, or even just lie down on Sofa. At this time, WinX HD Video Converter Deluxe is a good helper as it allows you convert UHD, HD SD videos to MP4 or H.264 for playback on a wide-range of devices, including the hottest iPhone 7/7 Plus, iPhone 6S/SE/5, iPad, Samsung Galaxy S7, Surface, Windows Phone, Chromecast, PSP and 410+ preset profiles. To our surprise, WinX HD Video Converter Deluxe is not just an HD video Converter, it also serves as a free online video downloader that let us download movie trailers, full-length films, tutorials, music video and so on from YouTube, Facebook, Daylimotion, Vimeo and 300+ online video sharing sites. You can also directly convert YouTube to MP3, iPhone ringtone for particular use. Embedded with a niche video editor, WinX HD Video Converter Deluxe allows you to tailor our videos by a range of editing features, such as trim, merge, crop, add subtitle, etc, in this way, you can get yourself a customized visual experience. In addition, you can use it to create photo slideshows by adding your personal photos and favorite music, upload to Facebook, Twitter, Instagram to share it with your friends. Based on the above analysis, we believe WinX HD Video Converter Deluxe is a great way to handle all video contents. You may say that there’re already a lot of free video converter or online converter in the market, however, either of them lack stability or have limited features. So why not get a mature and feature-rich paid software for free now that the chance is right here?